Lovely card and the image looks beautiful against your background. Thanks for joining us at Lil Patch of Crafty Friends. Adorable this lady in green. What a lovely image! I love your green! Thank you for playing with us at Sister Act card challenge! 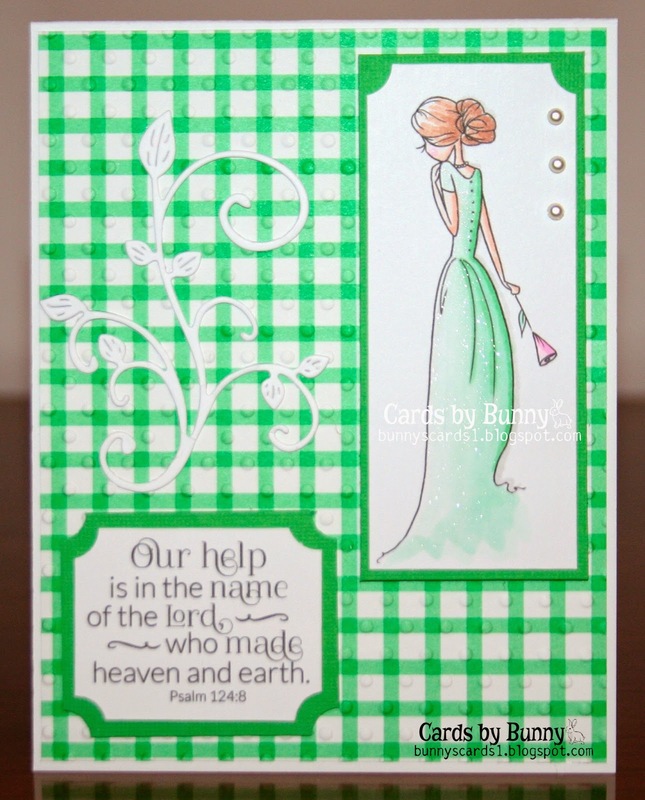 Wonderful card, love the style and image is so sweet, lovely shades of green too. Thanks for joining us over at Lil Patch of Crafting Friends, wish you luck and hope to see you for C#7. Lovely card, Bunny, that is a great image. Good luck and thanks for joining in on the fun at Cheery Lynn Designs challenge. Such a fresh and lovely design Bunny! Thank you for joining us in our challenge this week at Cheery Lynn Designs! She's a gorgeous image and I love this fabulous card Bunny! Thanks for playing in the challenge over at Cheery Lynn Designs! This is such a great card, I love this image and it's fab in green. Thanks for joining us at Eureka Stamps for our Green Challenge. Beautiful card. Thanks for joining us at Lil Patch of crafty friends. Good luck and hope you will join us again. Wow, this is pure elegance. Such soft and pretty coloring. Thanks for joining our challenge at Sami Stamps!